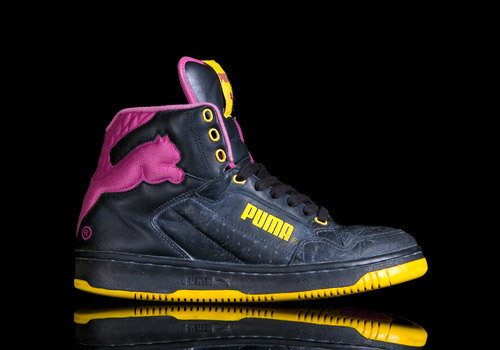 The PUMA Cat Hi retro from 2004 bridges both sports and artistic design. It offers excellent stability and comfort through its tongue and heel area that are well cushioned. This sneaker, which was basically produced for basketball demands, is also perfectly suitable for dancing due to it’s sturdy toe box and increased heel support. 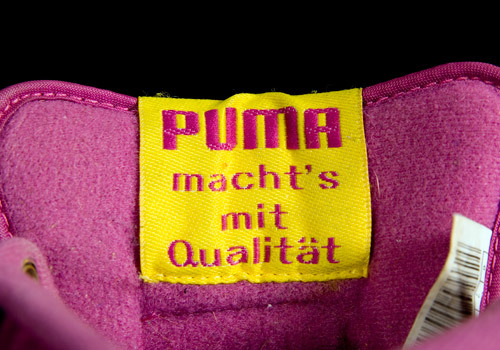 It’s mainly made of smooth leather except the purple mesh-cushioning along the heel area which depicts the shape of a puma. A playful and eye-catching shoe highlighted by its little details which emphasize the beauty of it, such as the harmonic triple colorway or the yellow oval eyelets. 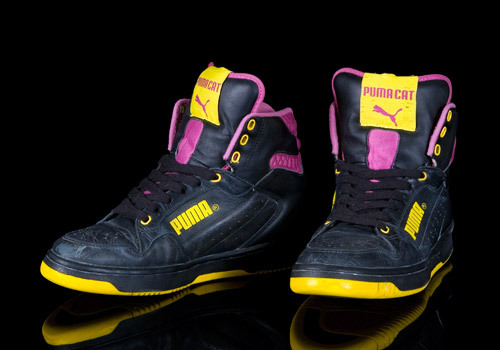 In addition you should know that the shoe exists in many different colorways also from 2004, such as a green, yellow, and black version (quite similar to the one depicted here), and a red and black version. But this one especially gives the shoe an outstanding vintage flair. 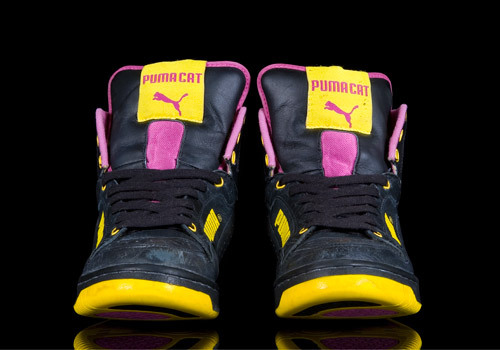 That was one of the many reasons why I wanted to own this sneaker. 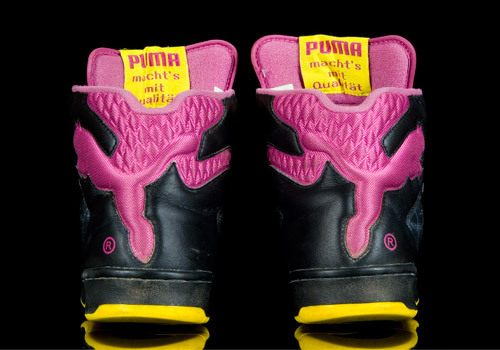 Another reason would be the unique cushioning of the striking puma along the outside which connects sport with art and makes this sneaker one-of-a-kind. 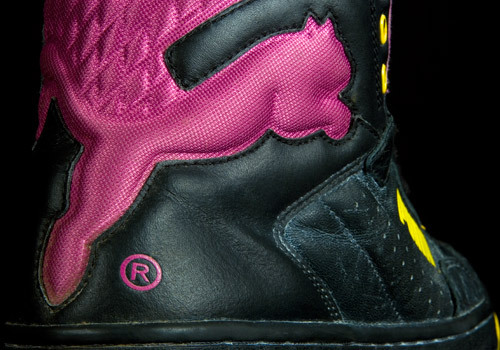 For various indigenous cultures the puma stands for strength of will and the ability to keep the golden mean between power and feeling. 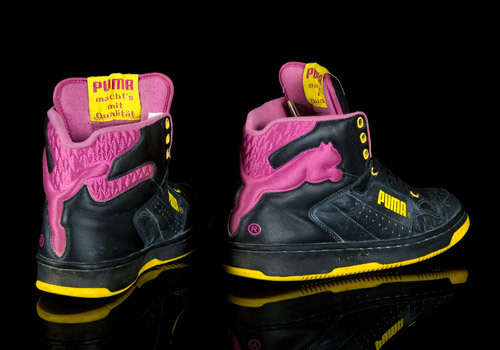 These PUMA Cat Hi’s realize this philosophy and they are for me – as an artist and sneaker freak – perfectly elaborated.